Expectations can be a difficult thing to manage. After her breakout hit Everything You Want Me To Be, author Mindy Mejia found herself primed to release another hit novel. I really enjoyed her last effort, so I was eager to read Leave No Trace. Like any followup novel, expectations were high. Fortunately for us, Mejia more than rose to the occasion. I'm pleased to report that Mejia's latest not only met my high expectations but also presented a story that is decidedly different from her last book. A decade ago, Josiah and his son Lucas Blackthorn hiked into the brutal terrain of the Boundary Waters and never returned. Search teams canvased the dense forests and glacial lakes. They finally found a campsite ravaged by what appeared to be bears. The Blackthorns were both assumed to have perished, and the family was forgotten. Flash forward to the present day. Josiah has been found on the border of the Boundary Waters, ransacking an outfitter store. He won't speak and acts violently towards the police. He is quickly transferred to a psychiatric hospital where language therapist Maya Stark is tasked with getting Josiah to communicate. Maya has a history with the facility predating her time as an employee. She also was abandoned by her mother at a young age, so Maya attempts to find common ground with the silent Josiah. He refuses to budge. As she delves deeper into the psyche of her patient, Maya is forced to face the traumas of her own past, a trauma that could threaten both of their lives. 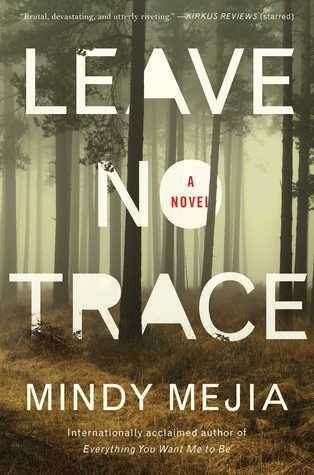 Immediately I was struck by how different Leave No Trace is when compared to Mindy Mejia's previous novel. The novel was advertised as a "suspenseful thriller", but I found it to be more of a slow-burning character study. The novel sees Mejia drop the alternating POV's of her previous work in favor of a more chronological timeline. By focusing mostly on Maya's perspective, Mejia lets the readers discover and grow with her characters. There is a mystery here, but it serves more to move the character's story than to lace the narrative with suspense. With Leave No Trace, Mindy Mejia cements herself as a versatile author who can enthrall readers through rich characters, riveting plots, and masterful prose. There's something to be said about an author who takes the time to research their topic to such an extent that they are able to create a story that completely inhabits the world they researched. In the case of author Don Winslow, he's studied the intricacies of the drug trade on the Mexican border for over 20 years. Winslow has recently taken to Twitter as a vocal critic to President Trump's border control policies. Whatever your political persuasions, there is no denying that Winslow writes and speaks from a place of well-earned understanding and expertise. He may just write fiction, but he's lived in the worlds he writes about, studied the complex social and economic factors behind that world, and written some killer fiction in the process. The Power of the Dog is nothing short of a masterwork. Attempting to summarize the plot or characters would be an injustice to the narrative that Winslow has worked so diligently to present. Imagine the best elements of a police procedural wrapped up with the crime elements of Sicario or Narcos, and throw in a touch of The Godfather or The Sopranos for good measure. That is just barely scratching the surface of the scope of this novel. Despite the multiple decades covered, crimes committed, and the sheer amount of character lines running through the novel, it never feels confusing or overstuffed. The story flows effortlessly off the page, a true testament to Winslow's ability to present such an intricate world. At the heart of the novel lies Art Keller, a DEA agent who has worked the Mexico cartels for years. He is motivated to bring down the notorious cartel run by Adan Barrera. Interspersed amongst this main plot are the stories of a young prostitute, a priest, a Mexican cop, and some Irish mobsters. Each character is impacted either directly or indirectly by the drug culture or the fight against it. From the mid-1970s to the early 2000s, we see these characters advance through time and experiences that have inevitable physical, monetary, and emotional ramifications. It truly is an in-depth portrait of the cause and effect of the "War on Drugs." For all the large set pieces and action, and Winslow spares no detail in his graphic and striking actions scenes, The Power of the Dog is ultimately an intimate character study and a conclusive referendum on the inner workings of both the drug trade and the fight to stop it. It is a true testament to Winslow's authorial prowess that the novel manages to cover such a large period of time and characters while still being the kind of thriller that you can't stop reading. Moreso, the depth of Winslow's research brings an authenticity that grounds this novel in a reality that is undeniable. Several times I had to remind myself that I was reading a work of fiction. 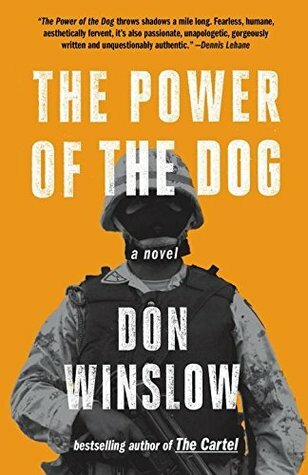 The Power of the Dog is the first in a trilogy that includes The Cartel and this year's The Border. It reads as a complete work, but I can't wait to see where these characters go next. Over the last several years, horror movies have seen a resurgence in the public eye. Series like The Conjuring films have proven to be both critical and commercial smashes at the box office. Other horror films, like Get Out and Us from Jordan Peele, have added a newfound sense of prestige to the genre. If you're a studio looking to make a movie that isn't a superhero film, horror is a pretty safe bet. It should come as no surprise then that many filmmakers are turning to Stephen King as a tried and true source for terrifying stories that the public loves. King has sold millions of copies of his novels and adaptations of his works have proven reliable box office draws for over 30 years. When I heard that a remake of Pet Sematary was releasing, I was excited to relive King's story once again. Like the novel it is based upon, this latest film iteration follows the story of the Creed family. Dr. Louis Creed(Jason Clarke) and his wife Rachel(Amy Seimetz have brought their two kids from the fast-paced life in Boston to the more relaxed town of Ludlow, Maine. Louis is excited to take on the role of the campus Doctor for the local university. He hopes that more stable hours will give him more time to spend with his family on their new rural home. Directors Kevin Kolsch and Dennis Widmyer interrupt the idyllic setting with the jolt of a large tanker truck blasting along the road next to the Creed home. As the family eagerly brushes off the interruption of the truck in favor of exploring their new home, the audience is filled with the dread of the inevitable events to come. Things immediately don't go as planned when Louis is unable to save a student from a gruesome accident. He's haunted by this death, seeing the deceased student in his dreams. Through a flashback that is one of the more terrifying moments in the film, we see how Rachel's childhood family trauma has scarred her and left her unwilling to discuss the topic of death. When the Creed's cat is killed by one of those fast-moving tankers, Louis is determined to keep the death a secret from his daughter. He turns to his elderly neighbor Jud, played here by an excellent John Lithgow, to dispose of the corpse. Jud leads Louis beyond the borders of the old Pet Sematary that lies on their property to the far off remains of an ancient burial ground. Little do they know that this simple task dooms their fate to be full of unimaginable horrors. 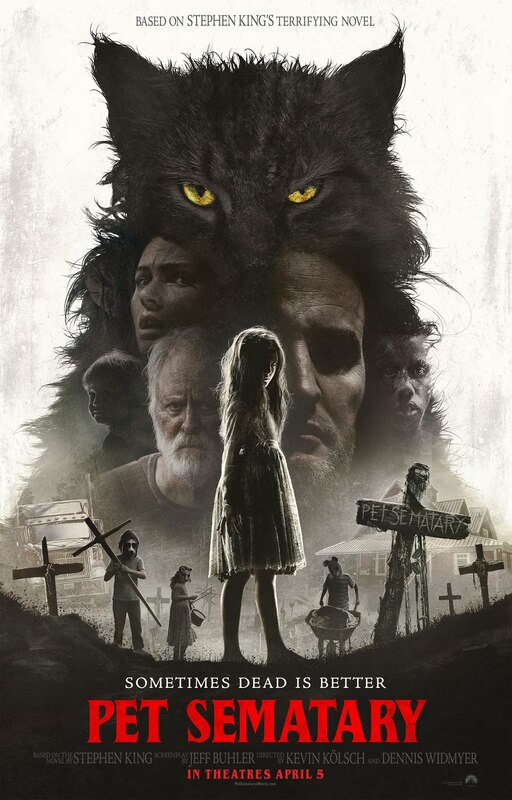 While much of this new Pet Sematary is quite faithful to both King's novel and the original film adaptation, it struggles to breathe new life into the story. As I sat watching, I found myself feeling as if the narrative was dragging while simultaneously skipping past important plot points. It was as if the filmmakers were so eager to get to the "spooky" parts that they didn't give enough time for their characters to reflect on all the crazy stuff that had just happened. Tethered by a script that doesn't give them room to soar, the actors weren't able to elevate their characters into believable and empathetic people. When some of them inevitably came back as undead versions of themselves, it was hard to differentiate between the two. In the end, Pet Sematary is one of those remakes that simply doesn't have a good reason to exist. While I didn't hate it, I can't say that I really enjoyed it either. It was an exercise in redundancy. Before filmmakers rush to readapt any other King stories, maybe they should remember that "sometimes dead is better." "The world's an evil place, my darlings. . ."
Author Minka Kent has been on my radar for several years now. Many of my bookish buddies seem to enjoy her penchant for twisty, fast-paced thrillers, so I've been eager to read her works. Enter The Stillwater Girls, Kent's latest novel. The summary promised, "a chilling novel of psychological suspense," the exact kind of book that sends me into a fervor of reading through the night until I finish. And so when I got the opportunity to read an advance copy from the publisher, I settled into a comfy spot and started reading. Wren and Sage are starting to get worried. The teenage sisters have lived a life of careful seclusion in their cabin in the woods along with their mother and youngest sister Evie. For their entire lives, their mother has warned them of the dangers of the outside world. "You're safe here. With me. I'll never let anything happen to you," their mother says. But then Evie gets gravely ill, and their mother has no choice but to take Evie from the security of their cabin. It has been several months since the pair left, leaving Wren and Sage to fend for themselves. Food is getting scarce and the chill of winter threatens to take over any day now. One night there is a knock on their cabin door, and everything changes. Nicolette's dream life is starting to crumble. She's married to the man of her dreams and has a family fortune that ensures she'll never have to worry financially, but her life is far from perfect. Her infertility has left her desperate to have a child and put a strain on her marriage. Nicolette thinks becoming a foster parent might be the cure to her marital woes, but her husband Brant seems uninterested. When she finds the picture hidden amongst his personal belongings, she's almost certain he has given up on their relationship. What else could possibly go wrong? 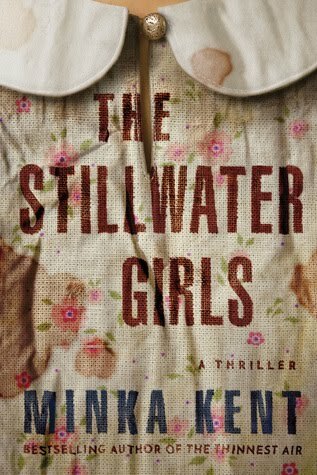 For 80% of The Stillwater Girls by Minka Kent, I was completely enthralled with the characters and mystery, breathlessly flipping through the pages to read what would happen next. Kent alternates the separate plots, ending each chapter with a small cliffhanger that keeps the reader wanting more. I kept telling myself, "just one more page!" Then the twist happened. Every review I've read of the book says the same thing, but it warrants a retread here. Up until the big reveal toward the end of the novel, The Stillwater Girls is nearly flawless. It's not that I wasn't expecting some grand unveiling of information that would somehow make sense of the two seemingly disparate narratives. It's just that the reveal wasn't believable. Worse, the twist seemed to sully all the great buildup that preceded it. All the careful plotting and character development were eschewed for a quick revelation that simply didn't work. And just like that, The Stillwater Girls went from being a superb novel of psychological suspense to an average thriller with an absurd ending. It seems like I was just writing about some of the trends in mainstream thrillers that I'm starting to grow tired of. I recently read Ruth Ware's The Woman in Cabin 10 and was feeling a bit bored with the similarities most of these books share. A friend from work recommended I read The Wife Between Us by Greer Hendricks and Sarah Pekkanen, so I quickly picked up a copy. As I started reading, I was seeing many of these conventions and fearing the worst. I trusted my friend's taste, so I persevered and kept reading. The book starts with the all too familiar setup. There was the female protagonist who drinks too much, struggles to keep a job, and has a history of mental illness. A traumatic event, in this case, a divorce, pushes that main character to the brink of a breakdown. Then some event leads that person to follow a lingering obsession that forces them to overcome their personal troubles for some kind of singular goal. It is a simple premise that has led to numerous bestsellers in the genre, so I wasn't surprised to see The Wife Between Us follow a similar plot. It is what happened next, however, that completely threw me for a loop. The titular wife in this novel is Vanessa. As you probably guessed, she's been down on her luck since her divorce with Richard. Richard is the polished business type who provided Vanessa with a life of comfort and luxury. They seemed like the couple who had it all until they didn't. Now Vanessa lives with her elderly aunt, works a low-paying retail job, and drinks to cover up her misery. Richard has wasted no time moving on. He is now engaged to the beautiful young Nellie. Vanessa is determined to break the new couple up. Is she the spurned wife driven by jealousy, or perhaps an unlikely hero driven to protect Nellie from something much more malicious? 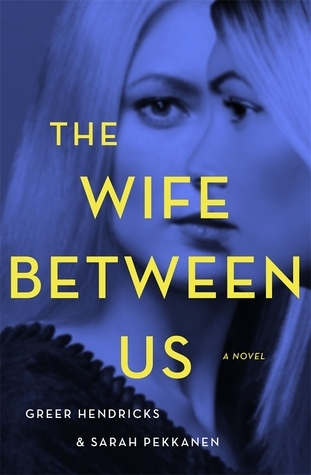 The Wife Between Us went from what I thought would be another run of the mill thriller to one of the smartest, twistiest novels I've read this year. Co-authors Hendricks and Pekkanen smartly lure the reader into their story by using the common conventions of the genre. They seem to say, "you've seen this before, so there's nothing to fear." Just when I thought I had this one all figured out, they threw in a curveball that completely turned the conventions upside down. Woven into this smart thriller are character moments that stuck with me beyond the mystery. The Wife Between Us completely lives up to its hype and has me eagerly anticipating Hendricks and Pekkanen's next novel. "Death is a mystery, and burial is a secret." 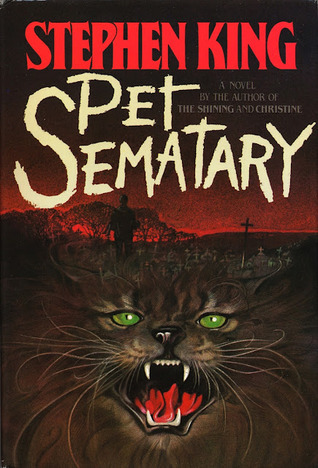 With the upcoming release of a new film version of Pet Sematary, I decided to revisit Stephen King's classic novel. I first read the book years ago and remember it being a different kind of horror. Unlike some of King's more graphic stories, Pet Sematary was a slow-burning family drama that chilled me to my core. This time, I opted to listen to the audiobook narrated by Michael C. Hall. The unease begins to mount from the very beginning. Louis Creed has moved his family from the city to rural Maine. They seem to be the perfect family. Doctor Creed, his wife, daughter, and son exude normalcy. But from their first moments in their new home, they know something isn't right. Louis quickly befriends his elderly neighbor Jud who warns the Creeds to be wary of the busy road that separates their two properties. Jud has seen that road claim countless pets over the years and recommends the Creeds have their cat fixed before it becomes the next victim. Jud's warning becomes prophecy when Louis discovers the battered remains of the family cat lying on the road. His family isn't home, but he knows his daughter will be devastated. Jud suggests Louis burry the feline in the 'Pet Sematary' on the edge of Creed's property. The pair take a moonlit stroll into the former Native American burial ground to put the family cat to rest. Little does Louis know that he's about to find out why "sometimes dead is better." Originally released over 35 years ago, Pet Sematary remains as terrifying and relevant as ever. I've always argued that the strength of King's writing lies not in his ability to conjure spooky scenarios, but in the way he crafts relatable characters who transcend genre and time. Louis Creed is recognizable as a young father trying to give his family the best life possible while facing the same kind of obstacles that any parent encounters. How do we teach our youth about life, death, and the unfairness that tragedy brings? King's fable smartly ponders these questions while weaving a tale of suspense that culminates in an ending that will leave you reeling for days and weeks to come. As King seems to say in all of his work, sometimes the scariest things in life lie not in the nightmares of our imagination but in the everyday moments of life itself.